It’s important to note that holding or raising wildlife without approval or permit is against the law. Contact your local wildlife shelter or DELWP (Department of Environment, Land, Water & Planning) Office, Customer Service Centre on 136 186 for advice. 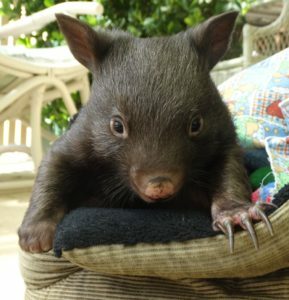 The whole reason we are caring for these wombats is to give them a second chance. A chance for them to return to the wild. There can be a lot of heartache along the way, with many difficult decisions to make so right from the word go we should be aware that these animals are not pets. 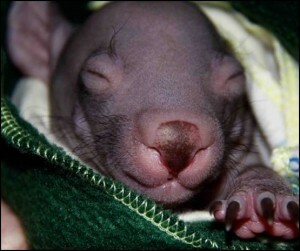 They have been entrusted to our care and we should always be looking and working towards their release. Do not imprint, you will jeopardize their lives. Don’t forget the joey will not be used to your environment, so be aware of everything you do. Are you housing it correctly? A new orphan is best kept in a secure confined space for the first few days. Subdued lighting may also help to reduce stress. If we try to replicate their life in the wild we may be able to reduce some of the stress. First check for dehydration. Read more…. Weigh your orphan – this is essential for correct feeding! Follow feed tables for correct use of formula. Always transition when changing between milk formulas. Including changes through different compositions of formula. ie. 0.4 to .6 (Wombaroo). The transition should be done slowly over a week. Changing milk formulas this way avoids any tummy upsets. 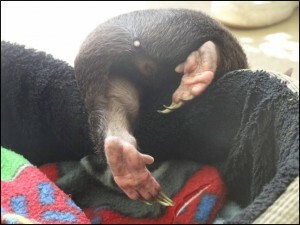 If at any stage during the transition of the formula the wombat develops diarrhoea stay at this stage or go back one stage until the tummy settles. New orphans over a kilo are often difficult to feed. 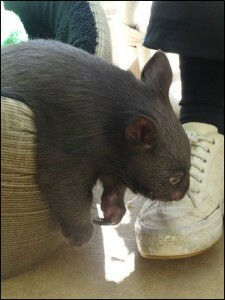 The older the wombat the harder it is. 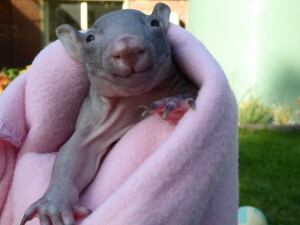 By this stage they know they are wombats and are not keen to try a new teat and milk. It may be days before they are taking the required amount. Firm, secure handling. Don’t force the feeding regime for too long if they are not interested. (this will cause more stress) A little often is best. Try for around 5mins if you have no success try again in an hour. The more they are handled at this stage the quicker they will settle into a new routine. Try a soft teat with a small hole. Wrap snugly with a bit of knee bopping and relaxing music also helps. Don’t panic they will eventually get the idea. Pinkies will need oiling – This should be done daily or more often if needed. Glycerine & water (mix half and half) this seems to be the closest to their natural skin moisture. Other products are sorbolene, paw paw, etc. Do not use baby oil. Wrap babies up to 1kg securely – it is important that they feel safe especially when feeding (their mothers pouch is very tight). 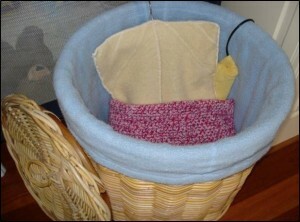 Secure the joey in a warm wrap and place in a snug pouch, this can then be put inside a hanging pouch or larger bunny rugs (if the joey climbs out of the inner pouch it will still find warmth and security in the folds of the larger wraps. 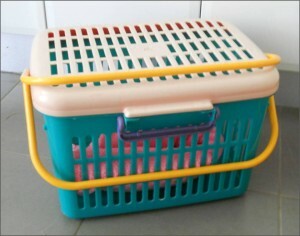 House joeys of this size in a Rio basket, carry bag, laundry hamper or something small where they will be safe and secure. 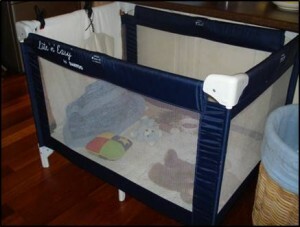 A hanging pouch is ideal as they are suspended similar to their mums pouch which is firm and secure. Feeding will need to continue through the night until the joey is furred. This can be offered in the form of an electric heat pad, heat disc or wheat bags. Place heat pad at the back of the pouch. Make sure all bedding is warm and keep a check on the temperature at all times especially when the orphan first arrives as the heat may need to be adjusted up or down. Do not use drawstring pouches. 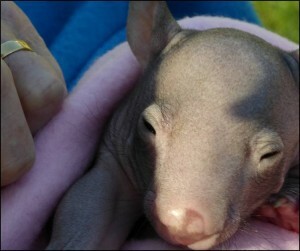 The joey may get tangled and the joey also needs to be able to move away from heat if necessary. This is the ideal size to introduce a buddy. A buddy makes each step of their development so much easier. Read more about Buddies…. 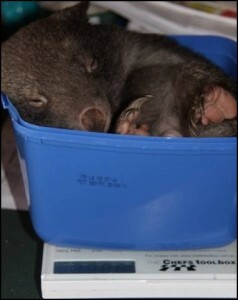 Joeys > 1.5kgs can be transferred to a port-a-cot or something similar in dimension. Joeys of this size will be starting to emerge from the pouch and an area like this will allow the joey to start to explore life safely outside the pouch. 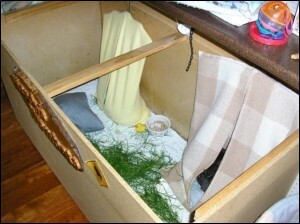 A strong wooden box can be made (as above) affectionately known as a Wombatarium. 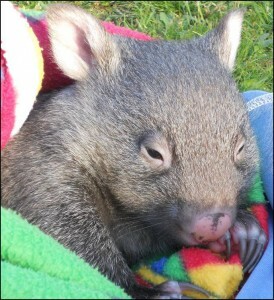 Young wombats with broken limbs may need to be confined to an area like this or smaller to allow injuries to heal. Small water tanks can also be used. Grass can be offered at this age. Pick it the day before to allow it to dry out, especially in the Spring when grass is very rich and moist. Rich grass can cause diarrhea. Heat may still be needed at this stage. Once the joey is furred this can be reduced or may not even be necessary, especially if the joey has a buddy to snuggle up to. 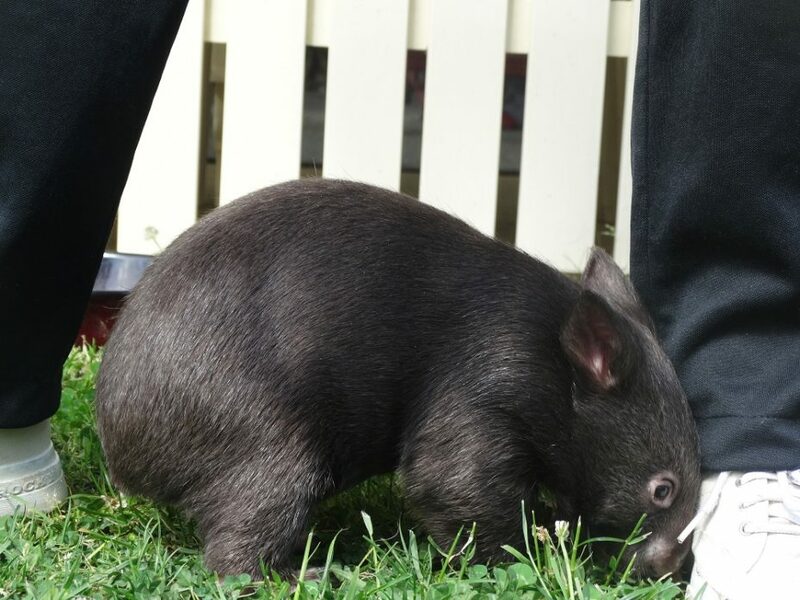 Supervised time out can be introduced at this stage as the joey will enjoy exploring and having fun and games with you. This is something they do with their natural mother. Sit on the floor so your joey can climb over your legs and knows that you are close by for security. Make sure that household pets and children cannot disrupt this special time. Once more this needs to be done gradually. Just a few minutes the first few times will be enough. 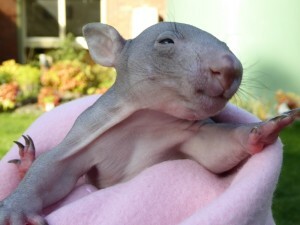 If your joey gets hiccups this means it has had enough and needs to be returned to the security of its pouch.